A new lease agreement with China should help Sukhoi tap into the Asian market. The Superjet faces tough competition from Bombardier, Embraer, China's Comac and Japan's Mitsubishi Regional Jet. Russia will supply 100 civilian aircraft Sukhoi Superjet (SSJ) to China over the next three years, Russian Industry and Trade Minister Denis Manturov said last week. According to the minister, five SSJ planes will be delivered to China this year. However, it is necessary to take into account that the planes are not sold, but transferred to a joint leasing company, which will distribute them in the markets of China and neighboring countries, where everything will depend on the demand of local carriers. The once-powerful Soviet civil aircraft industry fell into decline a long time ago. This decline continued throughout the 1980s, when the number of aircraft produced was gradually reduced. Soviet aircraft became obsolete morally and physically, while the defeated and disintegrated industry could offer nothing new to replace them.The share of domestic passenger aircraft in Russia's largest airlines’ fleets only amounts to about 6 percent. In 2014, the United Aircraft Corporation (UAC), which was created to save the domestic aircraft industry, produced only 37 civilian aircraft. The project to create the SSJ began in 2003 and was initially focused on the global markets. The creators of the aircraft from the design bureau Sukhoi, who have never been engaged in major civil aircraft, opted for a broad partnership with foreign companies, citing the need to accommodate all the best technology into the plane and to make it as globally competitive as possible. As a result, the share of foreign components in the aircraft is greater than 50 percent, and it would be a stretch to call the SSJ Russian. Was such an approach justified? The Superjet competes in the 100-seat class with Bombardier and Embraer. In two years, it will have two more strong competitors, China's Comac and Japan's Mitsubishi Regional Jet (MRJ). The global market for regional aircraft is estimated at 3,000 units, of which the US and EU markets, which “are effectively closed for Russian producers,” account for 70 percent, according to UAC head Yury Slyusar. As a result, Russia can count on its own market as well as the Latin America, Africa and Asia. Outside Russia, the SSJ has so far achieved its only notable success in Mexico, where a local company purchased 20 Russian aircraft. All other sales of the plane have been limited to one plane at a time. The deal with China is a real breakthrough in this sense. It was concluded on May 8, during a visit of Chinese leader Xi Jinping to Russia for Victory Day celebrations. But why should China, which is building a competitor to the SSJ, open its market for the Russian producer? According to experts, by 2035, the demand for aircraft in China will increase by 1,000 to 1,300 planes. China is confident that the market will be big enough for both planes, so why not let their companies also earn on leasing the SSJ, especially since the Russians are ready to make a favorable offer. 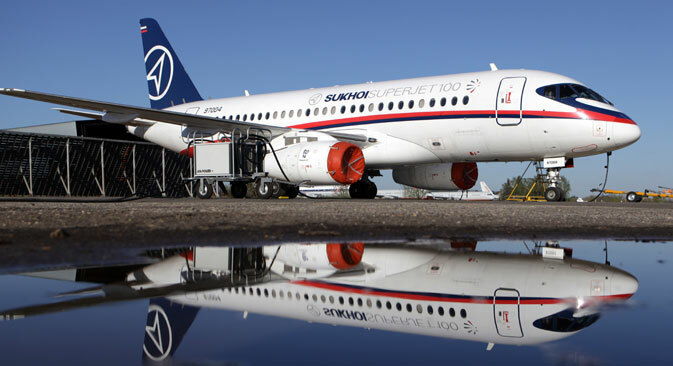 Within the next three years, the Sukhoi Civil Aircraft Company will deliver 100 aircraft of a total value of $3 billion, which will be operated under an operating lease. The Russian-Chinese joint venture will lease the aircraft to airlines for a definite period. According to the UAC head, the benefits of the SSJ, which should contribute to its success in China and Southeast Asia, include a favorable lease scheme and a high level of service. The SSJ is on average 2.5 tons lighter than competitors, thus offering significant savings to operators on airport charges and reducing fuel consumption by 5 percent. Only time will tell whether these benefits will help bring in profits to Sukhoi and lead to increased sales of the Superjet. Continent of opportunity: Can Russia compete with China in Africa?